The President (Dr B. Benjamin): Last year the Institute decided to award two Silver Medals in recognition of services of especial importance to the profession. One of these Medals was given to Mr Maurice Edward Ogborn to whom I had the pleasure of making the presentation last October; the other was awarded to Mr Robert James Kirton, C.B.E.-Bob Kirton to most of us. 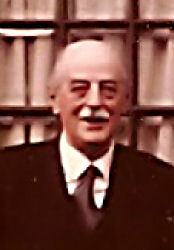 With regard to international activity, Mr Kirton served on the Cornell from approximately 1947 to 1955, during which period he was Secretary for Great Britain, and has rendered considerable service in connexion with International Congresses. He is, indeed, widely known all over the world for this activity. He was elected Buitengewoon lid of the Actuarieel Genoot-schap in 1950, shortly before the Dutch Congress, when he was National Secretary. Mr Kirton was a senior member when I myself qualified and I have always held him in considerable awe. I have memories of two significant contacts with him. The first was when he held the chairmanship of the Entertainments Sub-Committee of the Centenary Assembly. My own lowly task then was that of conducting, round London maternity and child welfare centres, the ladies of the visiting actuaries! They were very charm-ing ladies but it was a very lowly task. Somehow Mr Kirton managed to make it seem very important, and this is perhaps the hallmark of someone really big, in that he could make quite junior people feel big too. It was an interesting experience to observe at first hand Mr Kirton's considerable attention to detail and his consideration for everybody concerned in any activity with him. My other contact with Mr Kirton was when 1 took over the Recruit-ment Committee from him in 1956. He was certainly a pace-setter, with his many visits to schools and conferences, and he laid the foundation for the very high level of recruitment activity in the Institute today. This Silver Medal is awarded in recognition of services of special importance to the profession. I hope that what I have already said makes it clear that these services have been of a very high order. The Medal itself is a symbol of the national and international recognition already afforded to Mr Kirton. On behalf of the Institute, I have very great pleasure in asking Mr Kirton to accept this Silver Medal. I should first like to thank the President for his kind remarks. If I could bring myself half to believe that half the things said were half true I should be a very proud man. I am also very grateful for the way in which the Presi-dent's remarks have been received, and for this presentation. But I wish to add a Special word of thanks to the Council who have determined upon this award. It is, I feel, an act of great kindness, and I am deeply appreciative. All the jobs I have done have been immense fun. I have enjoyed every one of them. To be honest, there is one group that I did not enjoy: the duties which fell upon my shoulders from time to time of criticizing other people's work. It is a duty which has to be discharged but no one who has done it thinks of it as fun. The President has referred to the two papers in which I collaborated with A. T. Haynes. These were especially enjoyable occasions. So, too, was my work with the Student's Society in London, and also the work with the Student's Societies in Edinburgh and Glasgow. In particular I have enjoyed watching the progress through the examinations of the young men in my own office, and it has been a great joy to see them start on their professional careers and achieve some distinction. With the lapse of time perhaps a story concerning the London students may be told. We were facing the perennial problem of how to get the young men on to their feet and talking and I remarked, T suppose it is the presence of really senior men which has an inhibiting effect.' 'Oh, no, Sir', one young man said. 'It is the presence of assistant actuaries, who really know what they are talking about.' That perhaps illustrates the pleasure of working with the younger generation! I think that I should say one serious thing. The reference to services has brought to my mind the idea that the more authority a man has the more he is a servant-this paradox I commend for thought. In conclusion, I wish to express my appreciation to the President, to the audience and to Council. ROBERT JAMES KIRTON was born on 13 July 1901. He was educated at Merchant Taylors' School and Peterhouse, Cambridge, and then joined Scottish Widows as an actuarial student. He qualified as a Fellow of the Institute in 1930 and moved in 1932 to Scottish Amicable. In 1938 he joined Equity & Law as Assistant Manager, becoming General Manager the following year, a position which he held for 27 years. He was appointed a director of Equity & Law in 1944 and remained on the board until 1977. When Bob Kirton was appointed to Equity & Law, he anticipated that there were certain problems to be tackled, but he found the situation more serious than he had thought, because of unwise expansion of new business and speculative investments, and, with the outbreak of war, it became critical. He quickly set about establishing his authority. The board was reconstituted and a new Chairman appointed and Trevor Haynes and Lewis Whyte were brought in as Actuary and Investment Manager. The triennial valuation at the end of 1940 presented difficulties, but solvency was established although there was no surplus for a bonus declaration. The office was patiently nursed through the war-years and then expanded on a sound basis. This enabled Equity & Law, early in 1956, to be one of the first offices to declare a special bonus financed by appreciation of its equities. Bob was a member of Council from 1942 to 1961 (with the usual one-year breaks), Honorary Secretary from 1947 to 1949 and a Vice-President from 1952 to 1955. In 1966 he was one of the first two recipients of the Silver Medal which the Institute had then recently introduced for services of special importance to the profession. The Centenary Assembly fell in the middle of his term as Honorary Secretary and he was Chairman of the Centenary Assembly Entertainments Sub-Committee where his meticulous attention to detail contributed greatly to the success of the occasion. For a number of years afterwards he took a leading part in the international actuarial field and in 1950 he was elected an Extraordinary Member of the Actuarieel Genootschap in Holland. He established personal friendships with a number of American, Dutch and Norwegian actuaries. He was the joint author with Trevor Haynes of two important papers. 'Income tax in relation to Social Security', presented to the Institute in 1943, contained proposals for simplification of income tax and its integration with social security payments. At this time, following a rapid increase in the numbers of income tax payers. the Government were considering introducing a pay-as-you-earn arrangement but had difficulty in finding a suitable system. Bob has recounted how he and Trevor Haynes, whilst waiting on the platform at Watford Junction, devised the basis which was in due course adopted-and which is still used. Their second paper 'The financial structure of a life office' dealt with various aspects of matching and 'insulating' the office from the effects of changes in interest rates; it is a measure of the paper's value that much of what it contains is now taken for granted. It was presented to the Faculty in March 1952, one month before Frank Redington's paper 'The principles of life office valuation' was presented to the Institute. Although the approaches are different, there is much common ground between the papers and it was probably inevitable that Haynes' and Kirton's work would be overshadowed by Redington's classic. In 1964 Bob gave a talk entitled 'The Actuary in a Modern Society' to the Actuarial Societies in Copenhagen, Oslo and Stockholm which was published in the Scandinavisk Actuarietidskrift. This shows his special interest in the recruitment and training of actuaries-he was an energetic Chairman of the Recruitment Committee from 1953 to 1956 and he particularly enjoyed his Chairmanship of the Students' Society from 1950 to 1952. After the war, Equity & Law became a training ground for many actuaries and Bob instituted occasional dinners to which are invited all actuaries who have ever worked for the office; the number of guests is now over 150. He became a member of the governing bodies of Bath University and the London School of Economics, where he was prevailed on to continue until he was 85. He also devoted much time and effort to the sick and needy. He was Chairman of the Royal United Kingdom Beneficent Association for 16 years and was awarded the C.B.E. in its centenary year, 1963. He took a special interest in hospital administration and became very knowledgeable on the subject. But despite all his involvement at a senior level in these and other charitable activities, he always found time to visit friends and colleagues who were sick or frail. National pensions was another matter in which he was keenly interested and it formed a major part of his work for the Life Offices' Association, of which he was Chairman from 1945 to 1947 and Chairman of the National Pensions Committee at the time the Boyd-Carpenter scheme was being introduced. Bob was a compassionate man, with a keen sense of fun, who was much liked and respected by colleagues at all levels. He led a full and well-ordered life and enjoyed taking part in sports especially skiing, tennis and squash-all of which he continued into his 70's. He set himself the highest standards of integrity in everything he was involved in-from a major commercial transaction to a line-call in a friendly game of tennis-and he looked for the same standards in others. In retirement Bob liked to maintain contact with his old friends and he rarely missed a meeting of the Actuaries' Club where, before dinner, he would buttonhole members with questions or comments about what had been happening. He was in his usual good form at the February meeting of the Club, just a few days before the illness which led to his death on 7 March 1988.